The Housing & Development Board (HDB) is the public housing authority of Singapore, and a statutory board under the Ministry of National Development. Its ubiquity can be witnessed by anyone who has ever been to Singapore. As one of the most densely populated cities of the world, HDB flats are an architectural and visual manifestation of this phenomenon. Established 1960, the HDB provides hygienic and comfortable living spaces to more than 80% of Singaporean citizens. These nine paintings were painted at my parents’ HDB flat in Bukit Batok, a town I grew up in and am most familiar with. 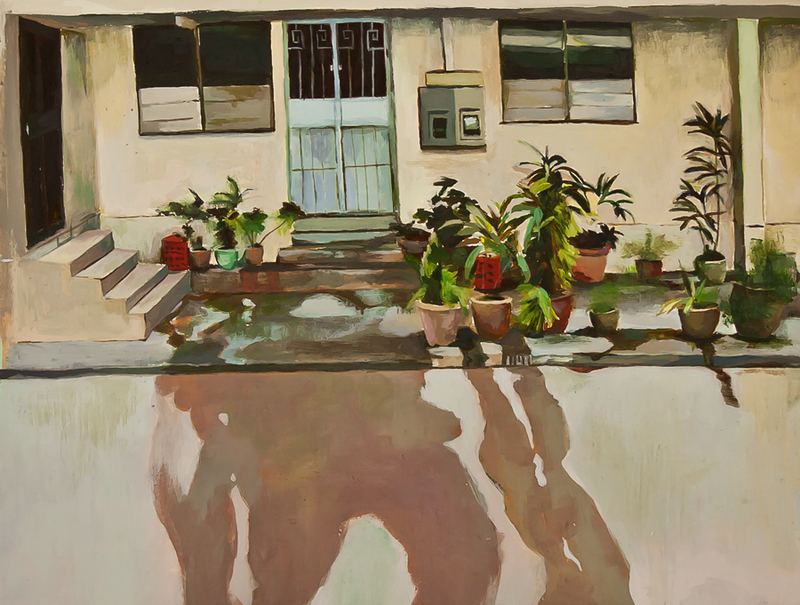 When I first decided to make a series of paintings, but was unsure of what to paint, the suburban neighborhood of Bukit Batok instinctively became my subject. Personally, I see HDB flats as the most genuine representation of the Singapore landscape. Its colorful dominance, together with its rigid structural layout, reflects the cultural identity of Singapore. My paintings emphasize the tranquility found within my neighborhood. From the corridor gardens of my neighbors to the wealth of colors in my void deck, nothing is simple when it comes to the colors of an HDB flat. The external walls of HDB flats are extensively painted with intense, warm chromatic hues. As I painted this series, I could not help but wonder whether the colors were applied with the same purpose as in mental hospitals, where warm chromatic hues are painted on the interiors to energize depressive patients. Of the nine paintings, one is not set in Bukit Batok, and instead sets up a comparison between a small cluster of HDB flats against Reflections at Keppel Bay, one of the most expensive private apartments in Singapore. All nine paintings were completed in acrylic, a medium I found most suitable for the subject and least hazardous to work within a small and compact HDB flat.